This Berkeley Class Combo Pro is the ultimately practical portable work table. Perfect for those who must find workable space at home or in a small office at a comfortable height. 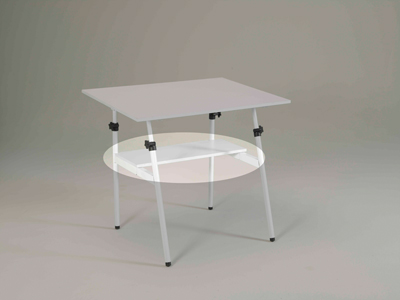 This product has a top that can provide work space for art, handicrafts, hobbies, or drafting. The white top surface (30x42”) makes the best use of available light, while the shelf below delivers accessible storage for work materials. The base is dark and easier to keep clean. The moveable shelf (12 x 32”) fits into a U-shaped channel groove for placement; it can be slid into variable positions within the unit and removed when folding for storage. This sturdy and clear space works well for any kind of close work. Professionals can use it for painting, drawing, or drafting. Hobbyists can use it for scrapbooking, beading, or sewing. It is sturdier than any other product available on line. Assembly required.